Mopar is skilled at showing the potential of Fiat Chrysler’s vehicles—and the Chrysler 200 S is no exception. 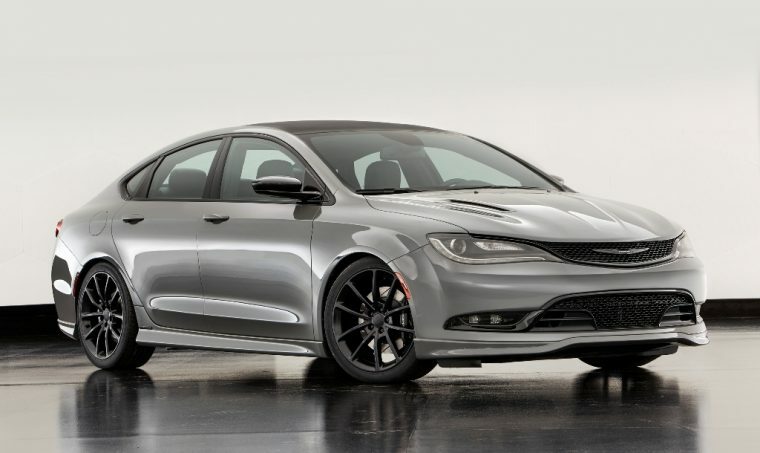 At the 2015 SEMA Show in Las Vegas, Mopar took hold of the Chrysler 200 S and gave it a bit of an attitude adjustment, showcasing the sedan’s power potential. Named the Chrysler 200 S Mopar, this concept car uses a variety of production and Mopar parts to offer a more muscular, athletic sedan. Ceramic Grey Metallic exterior paint and a production Mopar body kit, which includes side silles, a rear valance, and a front chin splitter, give the 200 S an intimidating look. Mopar 19-inch wheels add to this effect with a unique Satin Black finish, which contrasts well with its exterior color. This muscular exterior hints at the power that lies beneath the sedan’s hood. Mopar has kicked up the power of the 200 S V6 Pentastar engine with a cat-back exhaust and cold-air intake. The after-market tuner has also lowered the sedan’s suspension, which helps improve handling and drivability. Mopar also added plenty of luxurious materials inside the Chrysler 200 S Mopar’s cabin, including Katzkin leather seats, Mopar Blue piping, and accents throughout in the same color. While this vehicle won’t be available as a production model in the future, it’s great to get a peak at the potential the Chrysler 200 S has.